Coconut oil puts olive oil to shame. Lauric acid provides heat stability, avoiding the formation of trans fats under high temperatures. MTCs supply you with immediate energy, instead of making you tired. You can even use our organic coconut oil for skin and haircare. The coconuts we use in our oil are handpicked by small-scale farmers in the Philippines. The farmers select only the finest ripe coconuts with the help of ropes and bamboo sticks. The coconut meat is then removed by hand, grated, dried under moderate temperatures, and cold pressed. And that's how our raw, organic coconut oil comes to be. What do want when you buy something? It's gotta be high quality and offer the best possible benefits. Our organic coconut oil meets these requirements with ease. But that's not enough. Coconut farmers often live on the poverty line. Economic and social conditions at production sites can be difficult. Pesticides are often used in order to increase yield and maintain low prices. This is not who we are. That's why we use organically farmed, fair trade coconuts. Perfect value for the money. For everyone involved. Coconut oil can be used very sparingly. Usually 1 tsp, or just about a pinch, is enough. Coconut oil begins to melt at about 28 °C and can be stored at room temperature. This gives coconut oil a spreadable, almost liquid consistency, making it extremely easy to portion out. When frying, organic coconut oil remains stable up to 200 °C. Avoid heating coconut oil above 200 °C, as this can have an adverse effect on the quality of the oil. Unlike conventional oils, coconut oil gives dishes a somewhat exotic flavour. Coconut oil is not only for baking and frying,it can also be used to enhance fresh salads or as an alternative to butter and margarine on bread. I´m really into asian food and that´s the best oil. Maybe not for all dishes but I liiiike it!! Didn´t like it so much for cooking, but I use it instead for my skin. Pretty nice. So good. Perfect in vegeterian burgers or sandwiches. Tastes so good and naturally. Such a good product. Especially love the package. Did anyone try the peanut butter already? I love this coocnut oil. It has a really nice flavour to it, especially for Asian dishes. Will order any time soon again! I am not a huge fitness person, but this organic coconut oil really got me hooked. I'm obsessed with the diverse usage of coconut oil and love it to make my own granola as well as using it on dry skin parts. The nutritional benefits and healing properties of coconut oil have been know to the peoples of the South Pacific for thousands of years. Thanks to these properties, cold-pressed organic coconut oil is also becoming a vital part of western cuisine. Coconut oil is one of the most natural oils and can be distinguished by its extremely high content of amino acids. Thanks to its antioxidant properties and readily available fatty acids, organic coconut oil is easily well and provides long-lasting energy. 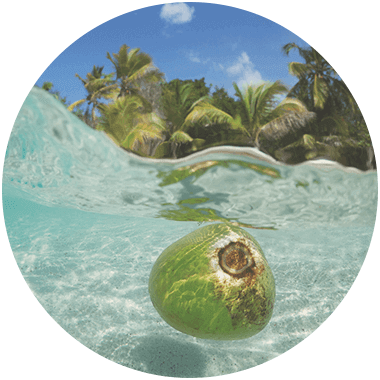 The oil extracted from the coconut has an above-average concentration of saturated fatty acids, which consist of 90% medium-chain fatty acids. The extremely high lauric acid content also stands out. Lauric acid makes coconut oil ideal for frying and cooking. Chemical stability, heat resistance up to 200 °C and a long shelf life ensure that no unhealthy trans fats arise when coconut oil is used for cooking. Coconut oil can even be used as a natural cosmetic to support a pure complexion. 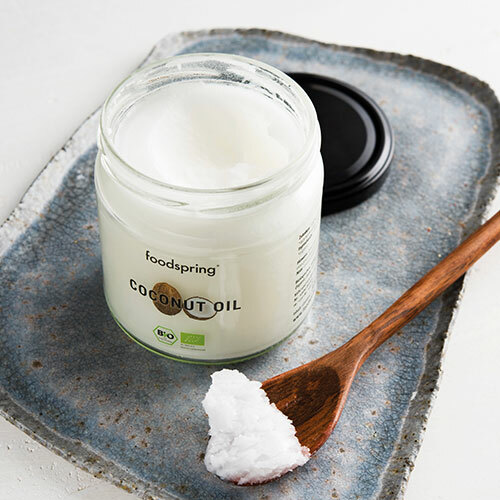 foodspring organic coconut oil is a natural handmade product made from sun-ripened coconuts. Immediately after being picked, the coconuts are transferred to the oil mill for processing. The coconut meat is then removed lovingly by hand and gently cold-pressed. The result is a first-class organic coconut oil in raw food quality, with an unmistakable crystal clear colour, gentle aromatic scent and mild coconut flavour. The coconuts for our raw organic coconut oil grow on 100% organic and sustainable palm trees to meet strict EU directives. So foodspring's organic coconut oil is a completely natural product. The extraordinary taste and the health benefits of coconut oil make it a real all-rounder for healthy cooking and low-calorie diets. And vegans, or anyone who suffers from an intolerance to gluten, lactose or soya, can enrich their diet with organic coconut oil. Thanks to an abundance of fine ingredients, mild scented coconut oil is by far the most versatile coconut product. High-quality coconut oil can have a wide range of positive effects on both your internal and external wellbeing like almost no other product. Organic coconut oil strengthens and tones the entire body. Furthermore, the organic coconut oil is better tolerated than other dietary fats, like butter and margarine. While these primarily contain long-chain fatty acids, coconut oil is characterised by its medium-chain fatty acid content. Medium-chain fatty acids can be metabolised better. They provide us with optimised usable energy that lasts longer. So-called medium-chain triglycerides are absorbed by the liver, digested with lightning speed and converted into ketones. These chemical compounds supply the brain with energy as quickly as possible and keep blood sugar levels constant. Your appetite is also reduced and you feel fuller - this benefits fat reduction. Combined with exercise, our body breaks down excess fat deposits quickly and effectively. Any reduction of body fat decreases the risk of cardiovascular disease and contributes to your overall health. It is perfect for both men and women and can replace any cream in the bathroom: It hydrates the skin without leaving a greasy film behind and contributes to a beautiful complexion thanks to its antibacterial properties. In Ayurveda, organic coconut oil has been used as mouthwash, an integral part of oral hygiene, for centuries. Mixed with water, organic coconut oil can also remove waterproof make-up without leaving any residue and as a deep conditioner it gives the hair new strength and shine. Positive side effect: Even high-quality organic coconut oil in raw food quality is cheaper than many creams in the long run. Since it melts at about 26 °C, it melts when applied to the body so that even just a small amount can cover a large area. A 100% natural product for the bathroom. As it comes, in a smoothie or in a soup: Coconut oil enriches any dish with its fine flavour. With a smoke point of 200 °C, coconut oil loses no flavour or nutritional value. That's why cold-pressed coconut oil is safe to use both for hot and cold dishes. With a subtle exotic aroma and a mild taste, coconut oil is not only healthy, it is also a perfect substitute for conventional cooking fats like butter and olive oil. Make Asian dishes with peanut butter extra creamy with a tablespoon of coconut oil. Organic coconut oil even adds a touch of the exotic to sandwiches when used as a spread and steaks when used in place of herb butter. If you need a real energy boost in the morning, before a workout or for the afternoon slump, add a splash of cold-pressed organic coconut oil to your coffee instead of milk. Just one teaspoon in a cup of Bulletproof coffee is enough for an exceptional energy boost. As the medium-chain fatty acids in organic coconut oil are quickly utilised by the body but have a long-lasting effect, you get twice the benefit: On the one hand they give you quick energy for a good start to the day and on the other hand they help you feel fuller for longer. Like all fats and oils, there are significant differences in quality when it comes to coconut oil. The selection of raw materials, the manufacturing processes and possible additives all affect the quality of the final product. That's why you should look out for high-quality, cold-pressed coconut oil. Organic quality, handmade and immediate processing of the coconut are important indications of a first-class organic coconut oil. After careful raw material sourcing, gently cold-pressing the coconut meat ensures an optimised nutrient content is retained. No chemico-physical processes should be used to bleach, cure, refine or deodorise the product. Only in this way can a pure and natural coconut oil in top organic quality be achieved. Coconut oil is crystal clear and has an aromatic, unobtrusive coconut scent. Additives of any kind, like preservatives and emulsifiers, reduce the value of the coconut oil. Why should I buy foodspring coconut oil? Not only do we use the best-available raw ingredients, we also emphasize the use of gentle, careful processing at every step, from harvest to packaging. 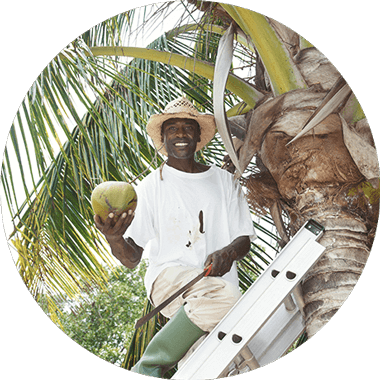 We work with experienced coconut farmers who employ specially trained harvest workers. They use a special technique to harvest the ripe coconuts and process them by hand within one hour of picking to maintain maximum freshness. 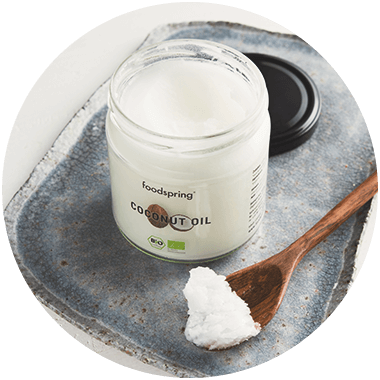 foodspring coconut oil is a virgin, cold-pressed, non-hydrogenated, unbleached oil that is also not deodorized. It’s organic, raw, and has a high lauric acid content. Our coconut oil bears the EU organic seal, a guarantee of high quality. What are the advantages of coconut oil for frying? Its aromatic taste and smell makes coconut oil excellent for frying a great variety of foods. Its high smoke point also means it’s stable and slow to oxidize. What are the benefits of the high lauric acid content? Lauric acids are a great source of energy and a real power supply for your cells. A sufficient supply of lauric acid also helps protect the lipid membrane, which supports the immune system. What does “organic quality” coconut oil even mean? Certified organic coconut oil undergoes very gentle processing in accordance with the strictest ecological guidelines. The coconuts are harvested and processed by hand without the use of any additives. What does fair trade mean at foodspring? We take fair trade very seriously and carefully screen our partners in advance. Our small-scale farmers work in accordance with strict ecological regulations, guaranteeing a responsible use of natural resources. Since the quality of foodspring coconut oil is largely the result of careful hand processing, coconut farmers regularly train locals as harvest workers and then employ them on the plantations. This means that the production of foodspring coconut oil benefits the local community both financially and socially. Coconut oil will be back in stock shortly.